First look at the much talked about "Neon J-Pack" SB Dunk Low. Expected to arrive next Summer. This month all the hype surrounding Nike SB is due to the unexpected arrival of the previously unreleased "Loon" SB Dunk Low. Nike SB continues to reach into their vault of classics with the much talked about "Neon J-Pack" SB Dunk Low also set to release next year. Similar to the 2005 release of the Air Jordan I inspired SB Dunk Low, the Neon J-Pack works with a predominantly black suede upper, along with neon leather taking place on the toebox and Swoosh. Leather makes one more appearance in black along the ankle area, while neon continues to dominate on the laces, outsole and branding throughout. 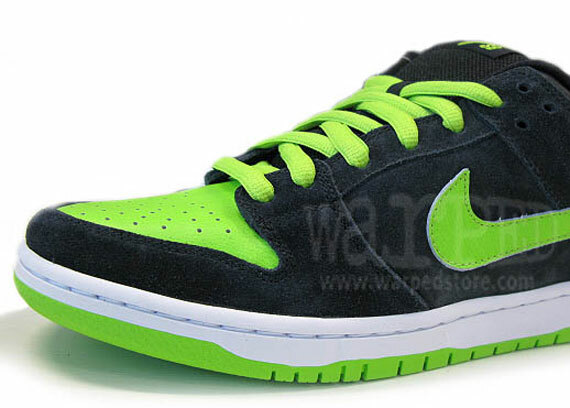 The "Neon J-Pack" SB Dunk Low is expected to hit Nike SB retailers sometime in the Summer of 2011.